JYJ‘s Junsu discussed his thoughts on the ending of the legal battle with SM Entertainment. [NEWS] XIA Kim Junsu mentioned his wish of standing as TVXQ infront of the fans in the future. T/N: The translation has been done very carefully, to make Junsu’s intention clear and accurate. 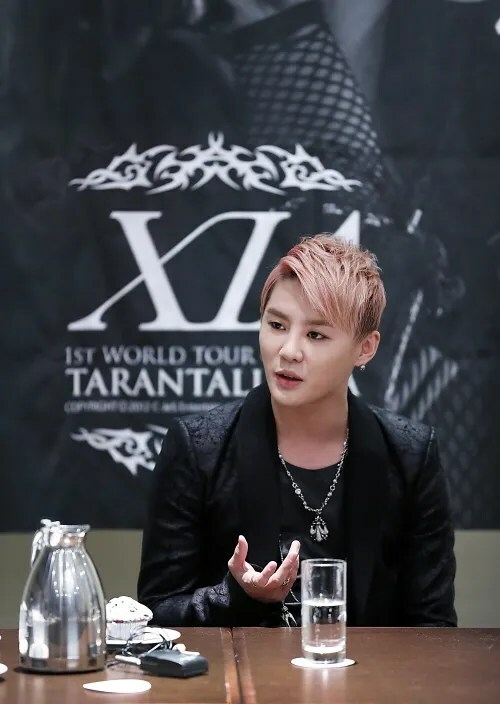 Kim Junsu held a press conference at a hotel in Essen on 29th, ahead of his last solo concert to end the world tour on 30th at Oberhausen, Germany. JYJ and SM Entertainment settled the dispute over the exclusive contract by agreement on 28th. Many fans are wondering about TVXQ’s future activities. XIAH Press Translator’s Note: What Junsu is saying about TVXQ is closer to ‘something he wishes but probably isn’t going to happen.’ He is saying he would be happy ‘if’ it happens, but realistically it is close to impossible. However, the memories of TVXQ will be precious to him. The nuance is very subtle so here I add a short explanation to clear any misunderstandings. Please do NOT omit, add or re-edit, INCLUDING the Translator’s Note. 1. [+737, -97] Seeing as how SM did edit the contracts for the rest of their artists after JYJ followed that lawsuit, there must’ve been something wrong with them. JYJ just took charge for it. 2. [+597, -93] To all of the SM lovers… Why are you so proud of a company that contracts you for 14 years and takes all of your money? So what if JYJ bought foreign cars? That’s not the problem, the problem is that there wasn’t a clear distribution of income. The problem is that the company was stealing their money. 1. [+273, -33] I looked up his songs after finding out that he won the best male award for his musical and he was really good. How’re people like me supposed to know unless they come out on TV? 2. [+234, -28] Do well on your concert~~ I trust that more great things will be happening!!! 1. [+572, -70] Wherever you are, I’ll always be supporting you. Kim Junsu fighting! 2. [+594, -192] People keep saying that TVXQ was legendary, but don’t they realize that they could only be legends because of the three JYJ members? The true TVXQ is not the current TVXQ but the old TVXQ including the JYJ members. The reason that couldn’t be protected was because of SM. Please leave the past in the past and go our separate ways now. Kim Junsu fighting! JYJ fighting! 3. [+438, -72] JYJ, thank you for walking the path of justice!!! We’ll always be with you until the end. Do well at your Germany concert, daebak!! I believe in you because you are Kim Jaejoong, Park Yoochun, Kim Junsu!!! In the end, it’s JYJ!!! Junsu-ah i am really like your bold answer. I am really proud to you and JYJ, despite being hated by some people who always said that you guys greedy or called you as a traitor but in fact you done a hard but very meaningful job. You guys know what the consequence from your guys act but you let yourself became a sacrifice for all of these long battle to create abetter environment to anyone who wanna be an idol. So if there are still many people hates and called you as a traitor then let it be…….because there are a fact that never gonna be changes, there are no more 13 or 10 years contract for hoobae because your effort. It’s no matter if you can or not to appear on TV, your fans always gonna stay with you, watching you and support you like always.